The results of the first tranche of our reader survey are below. This has been extremely useful in directing our research and event agenda for 2009. A big thank you to those who have taken part so far. We will close the survey at the end of January, so if you haven’t taken part yet, please do here (it takes 5 minutes). NB: We will donate to charity for every respondent (details here) and we will send all respondents a detailed analysis of the results in early Feb. There is an increasing acceptance of core Telco 2.0 ideas in the market, and a growing desire to translate the theory into practice. 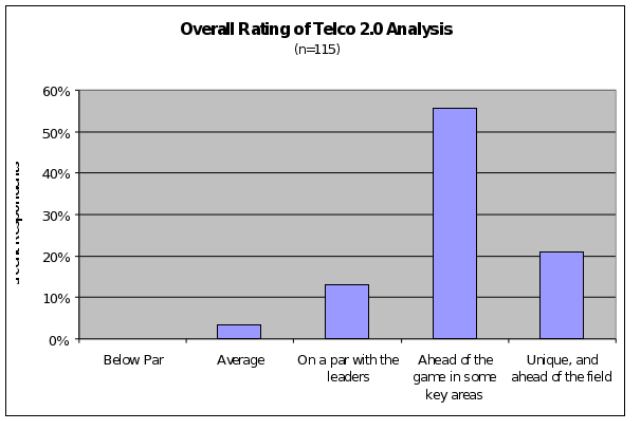 Overall, we were delighted at the positive views expressed on the quality and value provided by our analysis, with 77% overall scoring it “Ahead of the game” or “Unique”, rising to 90% for respondents from Telecoms Operators. ‘General Strategy’ and ‘Innovation’ topics scored most highly as areas of value, while ‘Case Studies’ and ‘Use Cases’ are also in high demand. Feedback from our events and other recent market experiences lead us to believe that these practical examples are a key means to help turn acceptance of the visionary theoretical principles into executive belief and corporate action. Case Studies and Use Cases will therefore be a key feature of the new Telco 2.0 ‘Executive Briefing’ Subscription Service. We will be focusing on these issues in our future research and our next event, on 6-7 May in Nice. 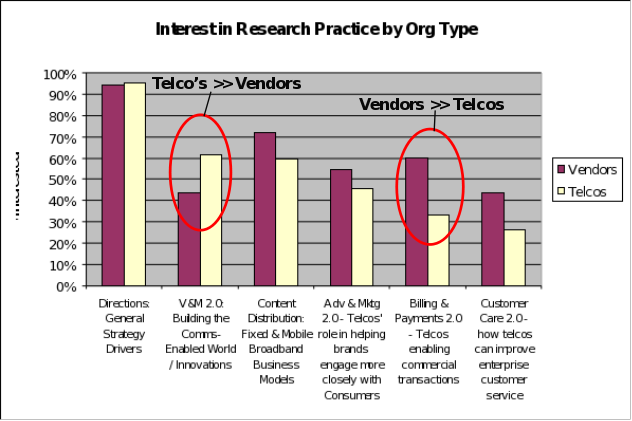 From the pool of respondents so far there was a mis-match in interest between Telcos and IT / Technology Vendors on two key topics. First, our telco readers are particularly interested in “Voice and Messaging 2.0: Building the Communications-Enabled World, V&M innovations” - showing that there is important life in the original killer application. Secondly, our Vendor community is more interested in analysis around “Billing and Payments 2.0: Telcos enabling commercial transactions”. Cynical observers may suggest that this implies a perceived lack of business opportunity in Voice and Messaging for the vendors, while there is big money in billing. We think the Vendors are missing a trick on Voice and Messaging - and as Werner Vogels CTO Amazon spelled out in his keynote presentation at our last event most valuable innovation comes from serving needs that always need to be served - but serving them better. Voice and Messaging serve the key need of Telco customers - to communicate. See our report on this topic here. It’s equally likely that Telcos are ignoring the critical importance of innovative billing capabilities to optimize Telco 1.0 and enable Telco 2.0 business models. One of our take-outs was that we (and the vendor community) will need to do better to bring those opportunities to life. Of the 115 people who’ve already earned our thanks and generated a charitable donation from us by completing the online survey by 30 Dec 2008, roughly one third were Telecoms Operators, half were IT / software / Hardware Vendors, and the remainder Consultants or from the Media and Finance sectors. Just over a quarter were at CxO or Director level, another quarter Senior Managers, and the majority had either Global or EMEA-wide interests. (To take part in the survey, go here).